Jordan Pickford insists his error-strewn display at Newcastle United was an aberration, as his place as England's number one comes under scrutiny. The 25-year-old gave away a penalty at St James' Park, which he then saved, before conceding three times as Everton let slip a 2-0 lead to lose 3-2. 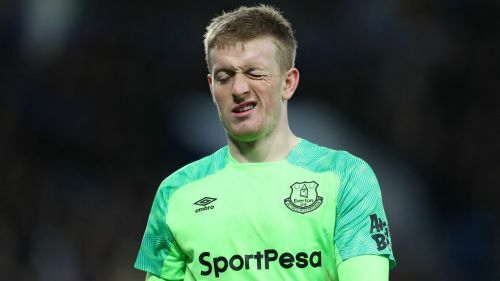 Pickford's performances this season have seen his position as Gareth Southgate's first choice appear precarious, with positive displays undermined by high-profile errors such as the one that allowed Divock Origi to score an injury-time winner in the Merseyside derby at Anfield. Pickford admits the occasion rather got to him in the Newcastle defeat, but he is adamant his form as a whole has remained strong. "With me being a Sunderland lad, in front of 52,000 Newcastle fans hurling abuse at you for the full game, maybe it did get to me a little bit too much," he said, as quoted by The Guardian. "But I'm only 25 and, as a learning curve for me, that's how I can improve. Next time I go there, I won't be getting involved as much. "Apart from the Newcastle game, I've been doing well, and I think I bounced back from that with a solid performance against Chelsea [in a 2-0 win]. That shows my mentality and my character, and the manager has put his faith in me to start against the Czech Republic [in Euro 2020 qualifying on Friday]. "Since the World Cup, I've seen the good side, getting rounds of applause in stadiums. That's different class, and what the England squad have hopefully done for the nation. But I won't be getting that at Newcastle ever. That's something I've got to deal with." England's Euro 2020 qualifying opener against the Czech Republic at Wembley on Friday will include a tribute to Gordon Banks, the 1966 World Cup-winning goalkeeper who died last month. Pickford says all the England keepers received backing from Banks before their World Cup campaign last year. "He sent all the goalkeepers a message," said Pickford. "Every player got a message from a different former player in their position – it was a really nice touch. "What a legend of a goalkeeper he was. With his family there, and a minute's applause, hopefully it'll be a special night and I keep a clean sheet for him."